The other day my sweet tooth hit. I needed something that was quick and not too unhealthy. 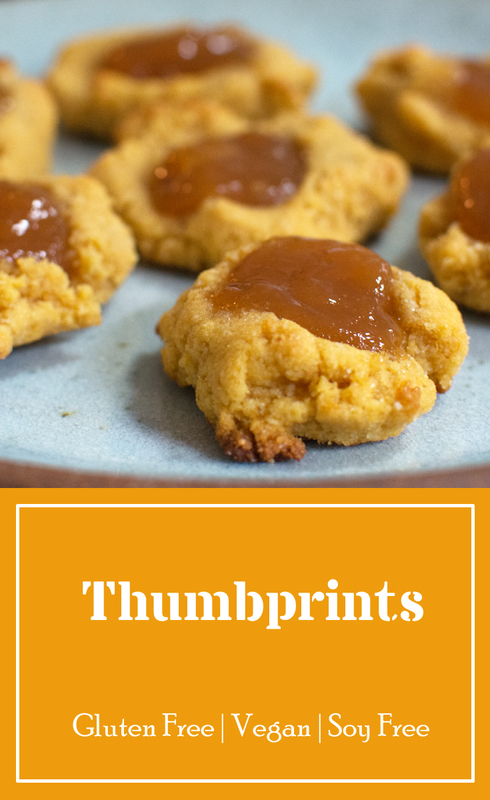 I have always loved thumbprint cookies and have had a few at gluten free places that were really good. So, I knew it could be done. Since even the gluten containing ones seem to be a little dry to balance the jammy inside it makes sense that gluten free would work. However, with a few little tricks I managed to make an anything but dry thumbprint. The key to all the best stuff I have been making lately is pureed pumpkin for an egg substitute. 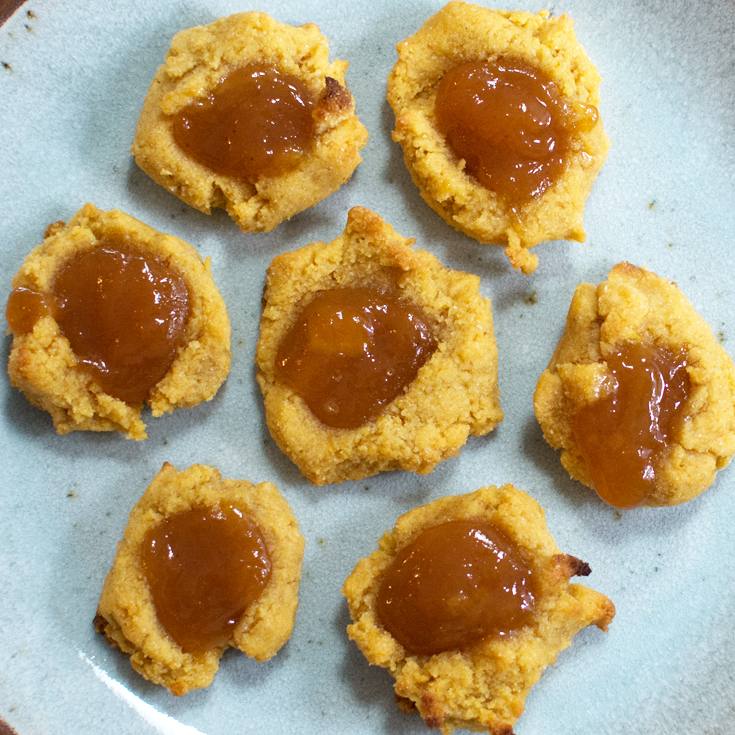 It doesn’t work for everything, some things need something a little more binding, but it does work wonderfully in these thumbprint cookies. These are very quick to make you can make and bake them in 25 minutes or so. However, I recommend letting the batter sit for a little while if you like soft cookies. It lets the wet ingredients be absorbed by the gluten free flour. Since gluten free flour often is a little more gritty this helps a lot with the texture. I let mine sit unintentionally for almost an hour and it was great. However just an extra 10-15 minutes will change the texture. 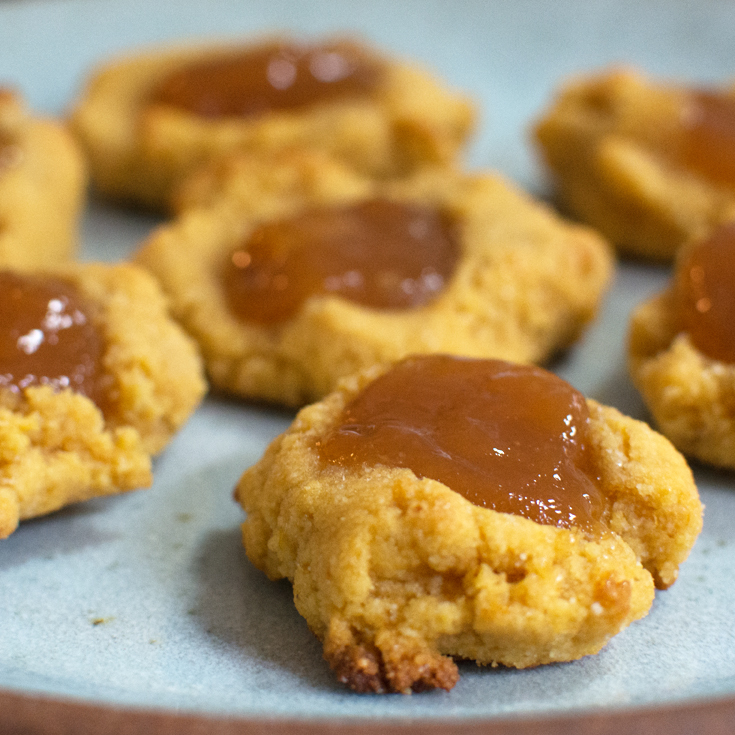 Thumbprint cookies are great for tea, kids, and holiday cookies. They are small and delicious. Plus since the are made with almond flour they are low on the carbs. Don’t get me wrong they have sugar in them, but are not super sweet. The almond flavor definitely comes through. My kid helped me make my first batch. She had a great time squishing the dough and putting her little thumbprint in there. They weren’t the most perfect cookies, but they were made with extra love and they tasted great. I love getting her involved in the kitchen. It really gives her a sense of accomplishment and she loves to eat and share what she made. It keeps her from asking me for cartoons and we actually make something tasty at the same time! The first batch we made we did both strawberry and mango guava jam in the center. The mango guava jam was surprisingly amazing! So I recommend it. I got the jam and the bulk bag of almond flour at Costco at great prices. However, if you cannot find it any jam will do. The classic raspberry is always good too. Check out the recipe below. If you want more recipes with pumpkin check out my chocolate chip pumpkin spice muffins! Warm the margarine substitute and mix it with the sugar and pumpkin. Then add the salt and flour. Mix everything together very well. Then, let it sit for a minimum of 10 minutes, 30 is better. Line your baking pan with parchment paper. Then, roll the dough into 1 inch balls and squish them into thumbprints with your thumb! This is the most fun part according to my kid. Top each thumbprint with a dollop of jam, approximately 1/2 a tablespoon. Then pop it in the oven for 8-10 minutes. Don't over cook as the bottoms burn easily. This recipe makes 12-14 thumbprints.